NEW YORK–If you’re one of the millions of New Yorkers who commute on the subway, you’ve probably encountered her. 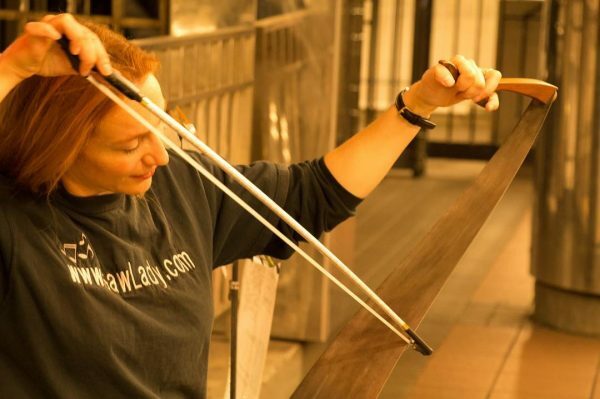 As you’ve jostled your way through Times Square or Union Square station, you may have noticed a woman playing a handsaw with a violin bow. 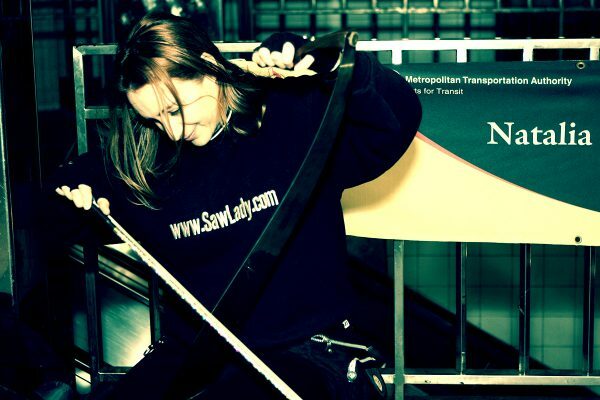 Meet Natalia Paruz, aka The Saw Lady. Paruz has played at acclaimed venues such as Lincoln Center, Madison Square Garden, and Carnegie Hall, but she got her start on the streets of New York. She’s also recorded two albums, an EP, and has appeared on records by numerous other artists. However, before Paruz was a professional musician she was a professional dancer. The accomplished musician first developed an interest in dancing when she was a kid, and it was one of the few passions in her life. “I just, you know, lived, breathed, slept, ate dance. It filled me completely. 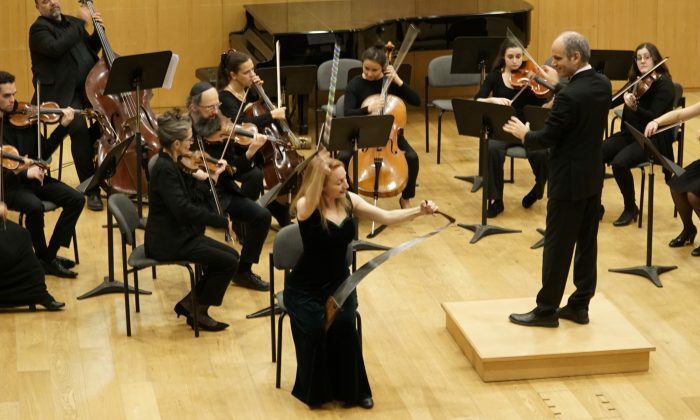 It was such joy,” Paruz told The Epoch Times. Toward the end of high school, she knew she wanted to pursue dancing professionally. She attended the Alvin Ailey School of Dance, and was accepted as a trainee at the Martha Graham Dance Company. Tragically, when she was just 16 years old she was struck by a car, which ended her dancing career. “It was a big shock. It was like a light went out of my life. Everything that I planned for myself, everything that I liked, everything I wanted to do all of the sudden was, in an instant, taken away from me,” Paruz said. The former dancer found it incredibly difficult to get interested in something else. She tried a variety of jobs, including computer programming, which she enjoyed, but it didn’t fill the hole she had inside of her. She had always seen herself as a dancer. In an effort to cheer her up, Paruz’s parents took her on a trip to Europe. Her parents initially took Paruz to Austria because “The Sound of Music” was her favorite movie growing up, and it was filmed there. While she was there, she went to a concert that featured a variety of different art forms. One of the acts was a man playing a handsaw. “It was the first time since the accident that I felt entranced, and mesmerized, and I felt this fire inside of me,” Paruz said. Paruz went backstage after the show and asked the man if he would give her a lesson, to which he responded “no.” After the two spoke for a while, the man sympathized with Paruz’s search for passion and told her to go home, pick up a saw, and try to reenact his performance. Paruz later discovered that the man wasn’t trying to brush her off, but rather it was the old time tradition of saw playing that dictated that one had to try it to see if it was meant to be. If you couldn’t figure it out, it wasn’t for you. Paruz returned home, borrowed a saw, and taught herself how to play. Since she wasn’t taking lessons, she was able to develop her own technique. She didn’t initially think of pursuing playing the saw as a career, but once her neighbor heard her practicing she connected her to a local Salvation Army community center to perform for a group of seniors. The 20-year-old was initially hesitant, but she wanted to help out. She prepared a 45 minute set, and the audience loved it. From there, a new passion and profession was born. Around the same time, Paruz was working at a Broadway theater selling souvenirs. She had to be present when theater goers were entering, exiting, and mingling during intermission. However, while the show was in progress she was free to do as she pleased. During the show Paruz would go into the corner of a parking lot outside the theater and play the saw to pass the time. One day, a man and his son stopped and listened to her play. After she was finished the man gave her a $5 bill. Paruz was confused until the man told her he was just trying to show his appreciation. When she returned to work she told her coworkers what happened, and they urged her to perform in front of the theatre during other theater’s intermissions. One of her friends put an empty box in front of her, and she played “Summertime” by George Gershwin. By the end of the 10 minute intermission, she had made a night’s worth of income that she would have made from her regular job. As she gained confidence in her ability, Paruz took her act from a side street to Broadway. When winter came, Paruz took her performance to the subway. She was a little nervous at first, but she gave it a shot. She went to the nearest subway station from work, which happened to be Time Square. She set up on the downtown N and R platform, and the first thing she noticed was the resonant, acoustic effect of the space. Furthermore, there she developed a more personal connection with the audience than she could on stage. The people in the audience could also develop a connection with one another. For example, one time Paruz saw a blind man and could tell by his face that he was enjoying the music. Another woman in the audience recognized his enjoyment as well, and bought one of Paruz’s CDs and gave it to him. “When you’re on the street, the people are right there with you. You see the transformation on their faces as they’re listening to your music. They come and talk to you. It’s an exchange of energy,” Paruz explained. Not only does she enjoy playing in the subways, she has gotten a lot of work from people passing her by. Although she’s an accomplished musician now, she still plays underground. When she plays on the subway she experiences two different types of reactions. The first reaction is curiosity and enchantment. The second one is from people who don’t initially believe the sound is coming from the saw. Sometimes she gets a third reaction, which is one of nostalgia from people who remember hearing it before. Unfortunately, many people have misconceptions about street performers. For instance, many people think they play because they can’t find work elsewhere or are homeless. 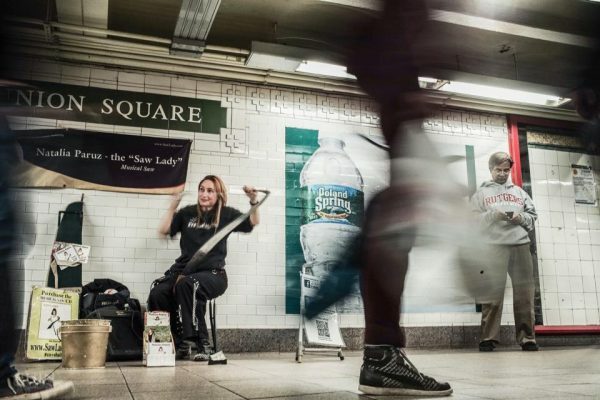 Paruz knows scores of street performers, and only two of them are formerly homeless. Furthermore, a lot of street performers have other legitimate jobs. Nevertheless, for Paruz, there’s an intrinsic aspect of her work that she finds most rewarding about street performing. “It’s getting to see the city from a different angle, and getting to be an integral part of the city for people,” she said. Michael Buble subway: Canadian singer Michael Buble gave an impromptu performance on the New York City subway station below the Lincoln Center. Scotiabank is hosting its annual BuskerFest on August 23-26 in support of Epilepsy Toronto. Performers from various countries and all corners of Canada set the stage for four days of continuous fun.